This study deals with the impact of party affiliation on the rise of the phenomenon of divorce in Zanzibar. It also provides a historical overview of the entry of Islam, its economy and history of political parties before and after independence of the country. Pointing to the high rate of divorce in Zanzibar, this study identifies major reasons behind it, which include affiliation to various political parties, discrimination based on the variances of islands, ignorance about religious teachings, inefficient knowledge about the purposes of familial relationships, regional chauvinism and political party racism. The statement of the problem in this research is that in contrast to rest of countries, the high rate of divorce phenomenon in Zanzibar is repercussion of the affiliation to various political parties and belonging to different islands. Likewise, this study digs out the motives of this problem which causes the disintegration of families and its solutions in light of maqāṣid al-Sharīʿah. This research contains three chapters. 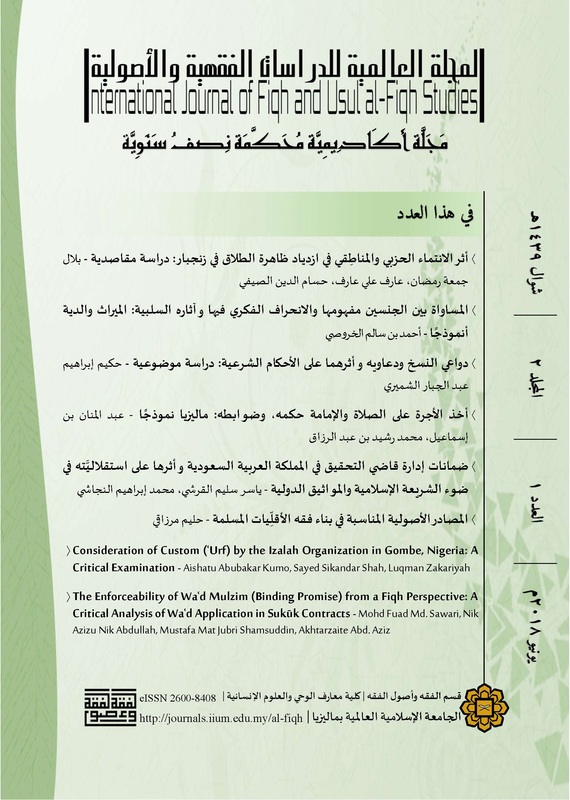 The first chapter analyses the history of advent of Islam and political parties to Zanzibar; second chapter deliberates on consequence of political affiliation in the rise of divorce rate in Zanzibar and third chapter discusses the role of maqāṣid al-Sharīʿah in reducing the occurrence of divorce because of party and regional affiliations. - Al-Bukhārī, Muḥammad bin IsmāꜤīl. 2002. Ṣaḥīḥ al-Bukharī. Bayrūt: Dāru al-Kutubi al-Ilimiyyah. - Al-Fayrūzaābādī, Muḥammad bin YaꜤqūb. 2003. Al-qāmūs al-Muḥīṭ. Taḥqīq: Muḥammad Ꜥabdu Al-Raḥmān al-Ma Ꜥashliy. Bayrūt: Dāru Iḥyāi al-Turāthi al-Ꜥarabī. - Al-Fayyūmiyy, Aḥmad bin Muḥammad. Al-Misbāḥu al-Munīr fī gharībi al-Sharḥi al-Kabīr. Bayrūt: Al-Maktabah al-Ꜥilmiyah. - Al-Jundiyyi, Samīh Ꜥabdu Al-Wahāb. 1429H. Ahamiyyatu Al-Maqāṣid fīꜤ al-sharīꜤt al-islāmiyyah. Bayrūt: Muassassatu Al-Risālat nāshirūn. - Al-Maḥdhūrī, Sulaymān Ꜥumar Nāsir. 2014. Zenjibār fī al-Ꜥaḥdi Al-Sayyd SaꜤīd bin Sulṭān. Masqat: Nādīy Thaqāfī. - Al-Najjār, Ꜥabdu al-Majīd. 2012. Maqāṣidu al-SharīꜤḥ biabꜤād jadīdah. Tūnis: Dāru al-Gharb al-Islāmiyy. - Al-Qurtubiyyi, Muḥammad bin Aḥmad. 1384H. Al-JāmiꜤ liahkāmi Al-Qurān. Al-Qāhirah: Dāru al-Kutubi al-miṣriyyah. - Al-Raysūn, Aḥmad. 1995. Naẓariyat al-Maqāṣid Ꜥnida al-Imām Al-Shāṭibiyyi. Ḥayrundon Fīrjītiyā: Al-MaꜤhadi al-fikrī al-Islamī. - Al-Shādhiliy, Aḥmad Nabīl SaꜤd. 1989. Aḥkāmi al-Usrat fī al-Fiqhu al-Islāmī. Cairo: Dāru al-Naḥḍah al- Islāmiyyah. - Al-ShaꜤāl, Muḥammad Khayri. 1432H. Al-daurat al-tāhiliyyat lilḥayāt al-zawjiyyah. Dimishq: Dāru al-fikr. - Al-Shirbīniy, Muḥammad bin Muḥammad al-Khaīṭb. 2006. Mughnī al-Muḥtāj. Taḥqīq: Muḥammad bin Muḥammad Tāmir. Cairo: Dāru al-Ḥadīth. - Al-Ṭwaybiy, Ꜥukāshah Ꜥabdu Al-Mannān. D.T. Al-zawāji al-mithāliyi. D, M: Maktabatu al-turāthi al- slāmiyyi. - Al-Zuḥayliyyi, Wahbat. 1428H. Al-Fiqhu al-islāmiyyi wa adillatuh. Dimishq: Dāru al-fikr. Bakar, Sayyid Ꜥabdu al-Majīd. 1405H. Al-aqaliyāt al-Muslimah fī Ifrīqiyā. Idāratu al-Ṣṣaḥāfah birābiṭat al-Ꜥālami al-Islāmī. - Butahe, Fidelis Butahe. 2016. “Pemba hali si shwari CUF-CCM hawazikani”. Retrived on 6 November 2017. From http://www.mwananchi.co.tz/habari/Pemba-hali-si-shwari-CUF--CCM-hawazikani/1597578-3236188-7ljf6kz/index.html. - Ghassany, Harith. 2010. Kwaheri Ukoloni Kwaheri Uhuru. Library of Congress Cataloging-in- Publication Data. - Ibnu Al- Ḥumām, Muḥammad bin Ꜥabdu Al-Wāḥid. 1415H. Sharḥ Fatḥu Al-Qadīr. Bayrūt: Dāru al-Kutubi al-Ilimiyyah. - Ibnu Khaldūn, Waliyyu Al-dīn Ꜥabdu Al-Raḥmān Muḥammad. 2004. Muqaddimat Ibnu Khaldūn, Taḥqīq: Ꜥabdallah Al-Darwīsh. Dimishqa: Dāru yaꜤkūb. - Ibnu Mājah, Muḥammad bin Yazīd. 1420H. Sunan Ibnu Mājah. Bayrūt: Dāru al-maꜤrifah. - Ibnu Quddāmah, Ꜥabdallah bin Aḥmad bin Muḥammad. 1992. Al- Mughnī. Taḥqīq: ꜤAbdallah bin Ꜥabdu al-Muḥsin al-Turkī. Al-Riyāḍ: Dāru Ꜥālami al-Kutub. - Ibnu ꜤĀbidīna, Muḥammad Amīn bin Ꜥumar bin Ꜥabdu al-Ꜥazīzi. 1992. Radu al-Mukhtār Ꜥalā al-Duri al- Mukhtār. Bayrūt: Dāru al-Fikr. - Ibnu ꜤĀshūr, Muḥammad bin al-Ṭāḥir. 2001. Maqāṣidu al-SharīꜤh al-Islāmiyyah. Taḥqīq: Muḥammad al-Ṭāḥir al-Mīsāwī. Al-Urdun: Dārual-Naffāis. - Issa, Mzuri Issa. 2015. “Scores of women ‘divorced or abandoned’ for voting in Tanzanian election”. Retrived on 23 March 2017. From http://www.independent.co.uk/news/world/africa/scores-of- zanzibar-women- forcibly-divorced- for-voting-in-tanzania- elections-a 6765996. html. - Issa, Mzuri Issa. 2015. “Scores of women ‘divorced or abandoned’ for voting in Tanzanian election”. Retrived on 23 March 2017 From https://www.theguardian.com/world/2015/dec/08/scores-of-women-divorced-or-abandoned-for-voting-in-tanzanian-elections. - Khalāf, Ꜥabdu Al-Wahāb. 1357H. Aḥkām al-aḥwāl al-shakhṣiyyah fī al-sharīꜤt al- slāmiyyah. Al-Qāhirah: Dāru al-Kutubi al-miṣriyyah. - Khalāf, Ꜥabdu Al-Wahāb. 1928. Aḥkāmi al-Aḥwāl al-shakhṣiyyah fī al-shariꜤah al-Islāmiyyah. Cairo: Dārual al-Kutub al-Maṣriyyah. - Kituo cha Katiba, 2011. Shirikisho Ndani ya Shirikisho, mhariri; Frederick Jjauko & Godfrey Muriuki, Fountain Publishers, Kampala. - Makoye, Kizito Makoye. 2015. “Scores of Zanzibar wormen forcibly divorced for voting in Tanzania elections”, Retrived on 23 March 2017. From http://www.independent.co.uk/news/world/africa/scores-of-zanzibar-women-forcibly-divorced-for-voting-in-tanzania-elections-a6765996.html. - Malengo, Faki Ali. 2017. “The role of Islamic Religious Teachings in Social Integration in Zanzibar: A case of Marriage Institution”. JASOC: Journal of Education and Social Sciences, Vol:7(1). pp. 275-282. - Mngodo, Esther Mngodo. 2014. “SPECIALREPORT: Concern as divorce rate in Zanzibar nears 32pc”. Retrived on 23 March 2017. From http://www.thecitizen.co.tz/News/national/SPECIAL-REPORT--Concern-as-divorce-rate-in- Zanzibar-nears-32pc/1840392-2565366-12hv7mtz/index.html. - Mohamed, Makame Haji. 2012. The legal and social implication of forced marriage in Zanzibar: Towards proposing Islamic Family Law act. Phd Thesis, International Islamic University Malaysia. - Muḥammad, Jamīlah. Zanzibar Female Lawyers Association (ZAFELA), Personal interview with researcher in her office at the Unguja Island at 9:00am, 19 January 2017. - Mwamvuli wa Jumuiya Zisizokuwa za Serikali Zanzibar (ANGOZA) (2007), Mkakati wa Kukuza uchumi na kupunguza Umaskini Zanzibar (MKUZA). Retrived on 24 April 2017. From http://www.hakikazi.org/papers/mkusa-plain-kiswahili.pdf. - Mwinyi, Talib Haji. 2012. “The role of Sulh Towards the Process of Reducing the Rate of Divorce in the Kadhi’ Courts in Zanzibar: Following the Malaysian Model”. AJBAS: Australian Journal of Basic and Applied Sciences. Vol. 6(11): pp. 166-178. - Mwinyi, Talib Haji. 2013. The study on the administration of practices of ancillary matter after divorce under Kadhis’ court in Zanzibar. Phd Thesis, International Islamic University Malaysia. - Personal interview with researcher at Madrasa Al-Inṣaf, Magomen area at the Unguja Island at 2:22pm, July 19, 2017. - Said, Muhibu Said. 2013. “Matokeo ya Sensa idadi ya watu yamtisha.” Retrived on 24 April 2017. From http://zanzibarnikwetu.blogspot.my/2013/01/matokeo-ya-sensa-idadi-ya-watu-yamtisha.html . - Said, Salma Said. 2015. “The male’s system was oppressed by women during the Zanzibar General Election”. Retrived on 24 March 2017. From http://www.mwananchi.co.tz/habari/Mfumo-dume-ulivyowakandamiza-wanawake/1597578-3003744-5btj5g/index.html. - Sayyid Qutubi. 1412. fī ḍilal Al-Qurān. Bayrūt: Dāru al-shurūk. - Sheriff, Abdul. 2001. Race and Class in the Politics of Zanzibar. Africa Spectrum: Institute of African Affairs at GIGA. Vol. 36 (3) pp.301-318. - Stiles, Erin E. 2012. “The Law of Marriage: Sexuality, Impotence and Divorce Suits in Zanzibar’s Islamic Courts”. Dosseir: Journal of Women Living Under Muslim Laws. Vol: 32-33. Pp. 59-77. - Stiles, Erin. 2005. “Muslim women and divorce in Rural Zanzibar”. Africa: Journal of the International Africa Institute. Vol.75(4), pp. 582-598. - Stockreirer, Elik E. 2015. Islamic Law, Gender and social Change in post-abollition Zanzibar. Cabrige University Press. - Taqrīr ḥuqūq al-Insān. 2010. Al-Taqrīr al-Quṭriyyi ḥawla al-Ṭasalsul al-Zamaniyyi liḥuqūq al-Insān. Tanzāniyā: Maktab al-dīmuqrāṭiyah waḥuqūq al-Insān wa al-Ꜥmal. - ꜤAṭwiyyah, Jamāl al-Dīn. 2003. Naḥw tafꜤīl maqāṣid al-sharīꜤt. Dimishq: Dāru al-fikr. - ꜤAwdat, Ꜥabdu Al-Qādir. D.T. Al-tashrīꜤ al-jināiyyi al-islāmiyyi. Bayrūt: Dāru al-Kutubi al-Ꜥarabiy.